A garage door off track is easily one of the most frustrating problems to come across. Garage door tracks help keep the door in place as it moves upward and downward when opening and closing. Garage door rollers can be found on the track, helping facilitate smooth operation of the door. An off-track garage door can make an entire garage unusable. Trying to use or access a garage that has come off its tracks can be extremely dangerous! Not only this, but a downed garage door can keep your vehicles and belongings trapped and leave them more susceptible to theft or damage. Off track garage doors can not only be dangerous, but they can also cause further damage to your door. Therefore, it is essential to understand some of the reasons for misaligned and off track garage doors in order to prevent any further damage to your garage door. Let’s take a look at some of the common reasons garage doors fall off their tracks. If your garage door falls off its track, the first thing to do is check the tracks to ensure they are still properly anchored on the garage wall. One of the biggest reasons doors fall is due to the tracks themselves coming off the wall. If the brackets that anchor the track to the wall are loose, be sure to tighten the bolts using a wrench or ratchet handle. If the garage door track is out of alignment, it could lead to the door coming off of it. IT is important to ensure that the tacks for your garage door are in their proper alignment. This can be done by using a level. For horizontal garage door tracks, it is best for the tracks to have a slight angle near the back of the garage. For roll-up doors, the track section should always be precisely level. If the tracks happen to be out of alignment, loosen the brackets that hold them in place. Then, by gently tapping on them carefully, realign the tracks into their proper positions. Another reasons garage doors come off track is due to the track being dented, bent, or damaged. A bad dent will easily put a door off track. These dents can be repaired by pounding them back into place with a rubber mallet. However, if there are multiple dents on the track or it is noticeably damaged, it may be worth going through the trouble of garage door track replacement. Consider hiring a professional garage door company for garage door track installation that you can trust. To ensure that the door rollers function smoothly and avoid running off track, it is important to lubricate the tracks and other parts of the garage door efficiently. Applying lubricant will help ensure that your garage door opens and closes smoothly. Repairing a garage door that has fallen off its track is not only difficult to do, it can be extremely dangerous too! Unless you have the right professional skills and tools to do the job right, these garage door repairs should be left to the experts. The best solution for a broken garage door track is to hire a reliable garage door company to make the necessary adjustments and repairs. If you are looking for garage door off-track service in Pensacola, look no further than RTS All American Garage Doors. 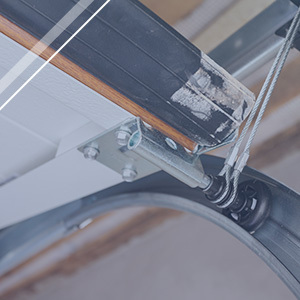 Our technicians have years of experience repairing, replacing, and installing garage door track to help homeowners avoid the risk of a downed and inoperable garage door. Contact us today to schedule a garage door inspection.